All the gorgeous new yarns and patterns for fall/winter will soon be released, and I realized that I'm not done with the things I wanted to knit with last years goodies! Just need to show you some of the prettiest sweaters I haven't made...yet! I love Rowan Kidsilk Haze Stripe. My favorite way to use it would be in this cardigan above. When I first saw this pattern I thought I'd make it in the round so the stripes would match, but then I thought, no, what I love so much is that it's not matching, that's now my favorite part! It looks kinda crazy and circus-like, it's fun and pretty, right? The color is "Cool". I used that same color in my Kidsilk Stripe Wrap but may just have to use it again for this. I love her bracelets too. And her face. 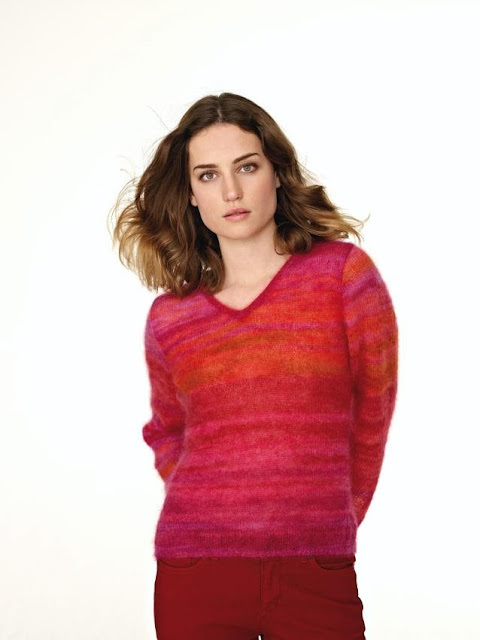 KSH Stripe is a perfect example of a yarn that does most of the work for you. The pattern should be kept pretty simple to show off the color stripes. Look at Leya below, perfectly elegant and simple yet so effective. Today I'm showcasing two pattern booklets that support this beautiful yarn. These first three designs plus 5 more are from the booklet, Kidsilk Haze Stripe Collection. The three patterns above are from this booklet. 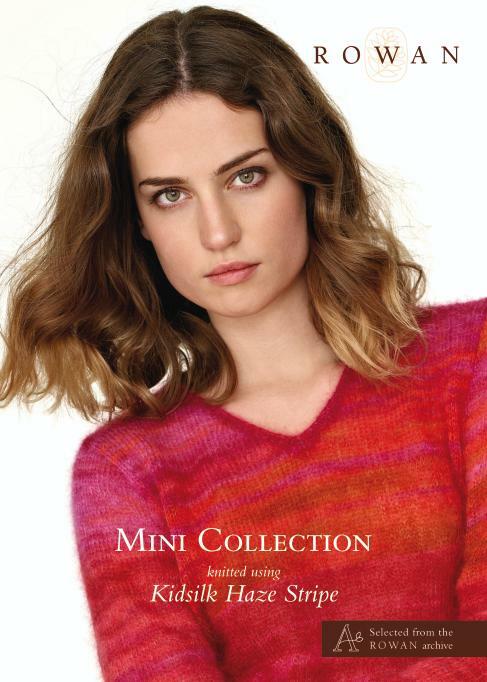 The sweaters below are from the Mini Kidsilk Haze Stripe Collection. Here are the links for you! Today, July 4th, we celebrate Independence Day in the USA. Americans feel very patriotic and social all week, lots of barbeques and parades. When we first moved into our home, our neighborhood would host a big potluck complete with a square dance caller, a decorated bicycle parade put on by the younger children and end the evening with a fireworks display at the end of our culdesac. We had a neighbor who would set up an enormous miniature train over his 1/4 acre front yard. Quite spectacular with an old west town, a circus, an English village and a Tyrolean village just to name a few. He kept it up all summer and miniature train enthusiasts from all over the world would come to visit. He was a pretty smart fella and would deputize my son and all the other little boys in the neighborhood to "patrol" the train set-up and make sure everyone was just looking and not touching. Of course, the little boys were the worst offenders but giving them an important job kept them from causing trouble. This morning we will go to our church's 47th annual Fourth of July Pancake Breakfast and then in the afternoon we are going to a backyard barbeque. Last night we were invited to Carole and Bill's house for a casual dinner. I loved her table decorated with simple straw mats, red napkins and flags in the flower vase! Hooray for the red, white and blue! This is such a delicious dish, saving this for our next family get-together. In a bowl stir together olives, tomato, oregano, garlic, 3 tablespoons oil, vinegar and pepper to taste. In a small bowl, toss shrimp with remaining tablespoon oil and salt and pepper to taste. Heat a well-seasoned ridged grill pan over high heat until hot and grill shrimp 1-3 minutes on each side, or until just cooked through. In a shallow dish toss shrimp with olive mixture and let stand 15 minutes. Sprinkle shrimp with feta and serve with bread. Serves 2, easily doubled or more. 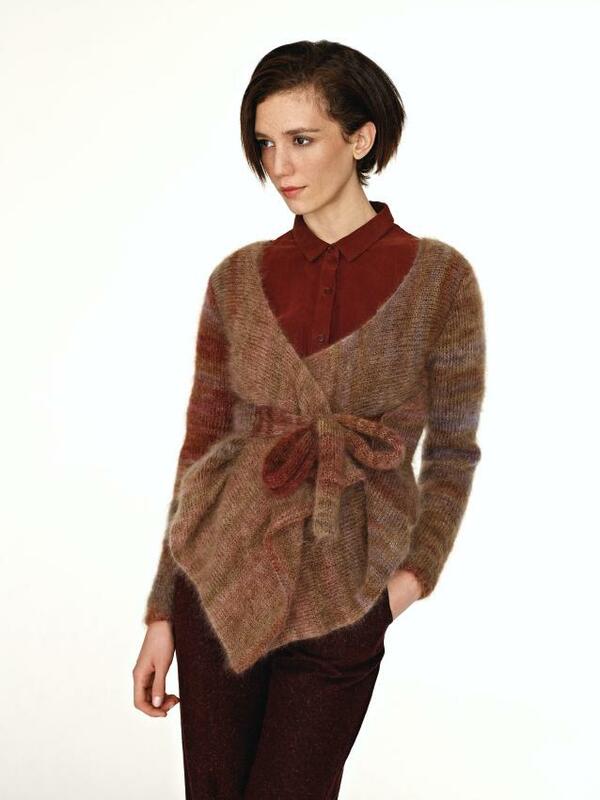 I agree about the mis-matched stripes on that first cardigan; normally I wouldn't like them but they look great here. And you know anything knitted in KidSilk Haze will feel fantastic to wear - you had better get knitting fast! Oooh your wrap is beautiful! Don't you feel like you want to knit faster to make everything you want! There are so many beautiful patterns and yarn out there. That Marja top is calling my name. We also had seafood for the 4th (crab salads), it was just too hot to cook. Have a great weekend! Beautiful sweaters. Are you going to make all of them? Angora Haze giveaway, still time to enter!